I am often asked what equipment I am using when I am active from a SOTA summit. Below is an explanation of the gear I use. 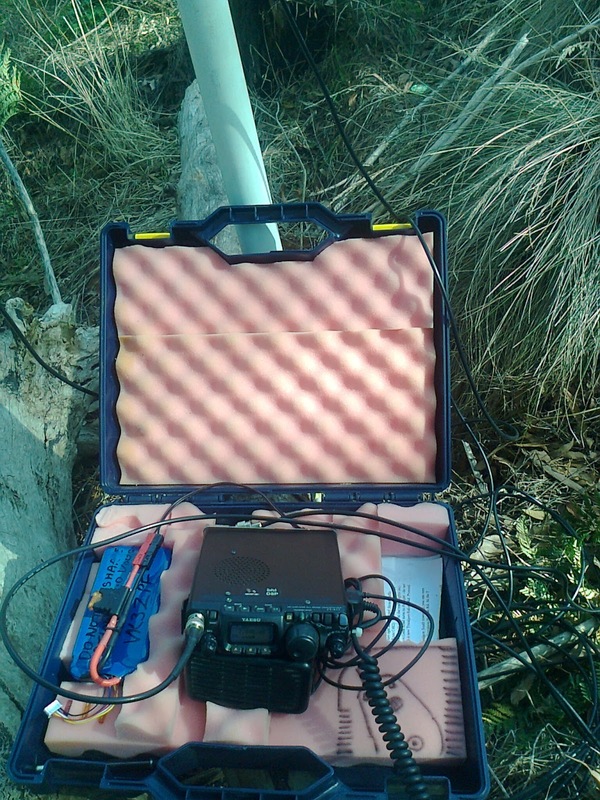 Like many SOTA activators I use an FT817ND. I have had this rig since April 2012 and it has performed faultlessly. Before the FT817 I used an FT7 for my first activation. The changes I have made to the FT817 are to add the W4RT DSP kit for reducing noise and I have used a cable tie to secure the microphone cord to the chassis to prevent strain on the RJ45 microphone connection. I often use an external speaker. During times of poor propagation I substitute a Yaesu FT450D in place of the FT817ND and enjoy the extra output power. The FT817 comes with an internal 1.4 Ah Ni-MH battery. This is big enough for short activations if I remember to charge it. Which I don’t! I also have two external batteries that I use. Recommended by Kevin, VK3KAB during the South Point activation, they are Lithium Iron Phosphate batteries. I use the Zippy 8.4 Ah LiFePo4 battery from Hobbyking. I find these batteries to be very good and have never let me down. The batteries are terminated with genuine Anderson PowerPole connectors and have an automotive style blade inline fuse for protection. I have load tested the LiFePo4 battery and compared it to a 7.2 Ah SLA battery. The results are published here. Using a Turnigy Accucel 6 balancer/charger I charge it the night before an activation and again when I come home. Using the balancer/charger means I get the best life from the battery. To get my gear to the top of the hill I use one of two packs. One pack is a 70 litre hike pack which gives me plenty of room for radio and all the other stuff I want to take. When using this pack I carry the FT817 in a foam lined plastic carry box which has plenty of room for the radio, external battery, external speaker and my Nexus 7 inch tablet I use for logging. The 70 litre pack also holds the 9m squid pole on the outside using two ratchet tie down straps to secure it against the radio box. I use the lower part of the pack to carry my wet weather gear. If need be I can also strap a small tent low on the back as well. My second pack, used only when the trip is going to be rough, is a Black Wolf 30 litre pack which has just enough room for the radio, battery, tablet, antenna and wet weather gear. There is no room for the squid pole so I rely on trees to hold the antenna. Regardless which pack I use I always have room for a bottle or two of water and my Personal Locating Beacon. It is stored on the top outside pocket on either pack. Hopefully I never need to use it but if I do it is there. Over the years I have tried many portable antennas including trapped dipoles, trapped ground planes, droopy verticals, quad loop and a linked dipole. It is the linked dipole that I use most often. It covers 10, 15, 20, 40 and 80 metres although I rarely use anything but 40 metres. This antenna travels in a blue fabric bag along with 15 metres of RG58A coax. fits over the top of the squid pole, above the HF dipole, and has its own coax. This antenna is based on a design by Mark VK3ZR. The linked dipole is normally held aloft by a 9 metre squid pole when the walk to the summit is relatively easy and with few overhanging branches. I have a length of PVC pipe over the bottom of the squid pole which allows me to use ratchet straps to secure the pole against what ever is handy. The PVC pipe takes all the pressure of the straps and protects the fibreglass pole within. When I know the climb is going to be difficult, and there are trees at the summit, I will leave the squid pole behind and take a 16 oz, 453 grams throw bag and a length of rope. Using this throw weight, and a much practiced swing, I can get the antenna up between 7 and 11 metres into a tree without too much trouble. It takes a little bit longer than just setting the squid pole but the ease of walking without the pole makes up for it. When I first started SOTA operating I would use a notepad and pen to record the QSOs. I would then come home and write the QSOs into my main paper log, type the QSOs into my electronic log and type the QSOs into the SOTA database. This was over handling in the extreme. At the end of 2012 I stopped using my main paper log, relying only on my electronic logging program. Shortly after I wrote an application for my Nexus 7 inch tablet to collect QSO information during SOTA activations. 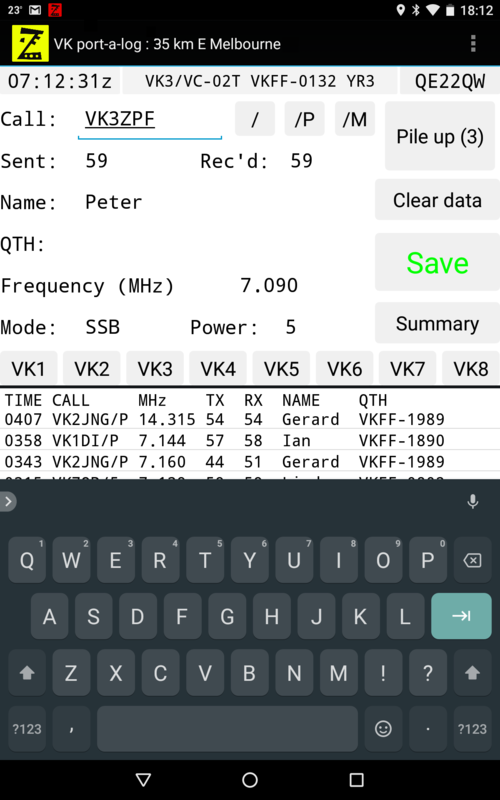 The VK port-a-log app creates four files, two in CSV format for uploading to the SOTA database, one is ADI format for importing to my main log program and one is ADI format for submission to the local WWFF coordinator. This saves a considerable amount of time when I get home from an activation. When working from a SOTA summit I try to choose the best available location to work from within 25 vertical metres of the summit peak, depending on the location and the weather. This may be out in the open to enjoy the view, behind a fence to shade from the sun, on a rock, in a tent out of the wind and rain, fully covered to keep warm or, if I’m really lucky, at a table and chair under a roof. Great write up, got the same battery for my go box also thanks to this article. Thanks for some good reading. Thanks for a great blog, highly enjoyable and informative. Fairly new ham operator and just found out about the world of SOTA, I hope to contact you one day on the air.